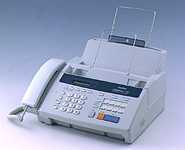 This plain paper fax and phone has a lot of functionality in a compact, space saving design. Featuring a 10-page auto document feed, 100-sheet paper cassette, up to 250-page print cartridge and convenience copying, it's ideally suited to handle the volumes typical of home and small office applications. QuickScan, fax broadcasting, and auto dialing are some of the features that make this Brother fax machine so valuable for small or home offices.